Now you can make this amazing side at home and enjoy all its divine flavors. This would be a highlight on any Thanksgiving or Christmas table and is always one of our faves! This is part of our 25 New Holiday Make Ahead Casserole collection where you will find even more great recipes. I think sides make the meal, everyone loves a great casserole!! 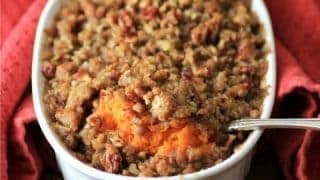 Crispy sweet pecan topping with creamy sweet potatoes underneath, even a person who doesn’t like veggies will be diving into this dish. It is the perfect accompaniment to turkey or other meats. It is comforting and screams the holidays!! Everyone will be wanting seconds of this dish so you can make extra by doubling the recipe. 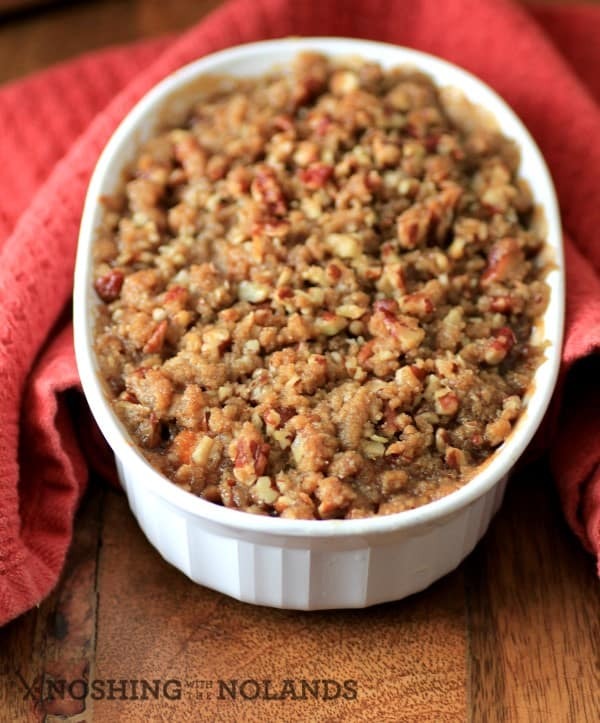 This screams comfort food for the holidays or anytime. No marshmallow topping here!! Just a yummy pecan brown sugar streusel. This is a clincher to a side that everyone will love even the people that don’t like sweet potatoes or veggie casseroles. What are some of your favorite casseroles for the holidays? Do you make the same thing every year or mix it up? I like to have some standards and then add something new too!! This can also be made ahead and then the topping added on and warmed in the oven. You will get rave reviews from everyone who tries this!! If it already isn’t a family favorite for the holidays it soon will be. INDULGE, ENJOY AND CELEBRATE!! 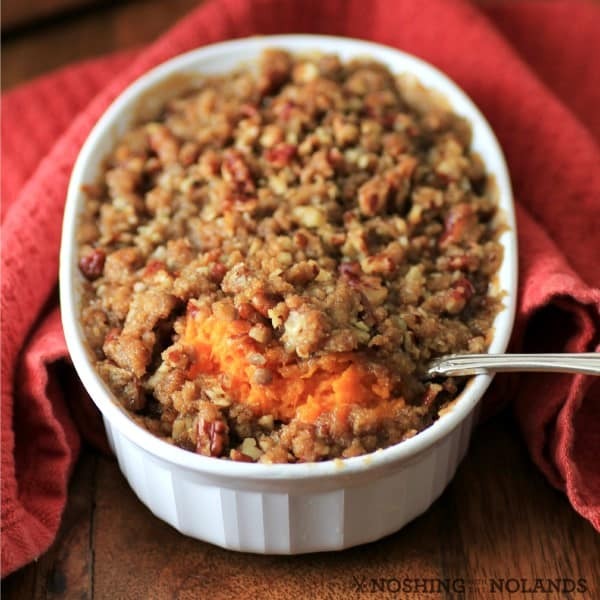 Ruth's Chris Copycat Sweet Potato Casserole is an awesome side dish that eveyone will love. It is easy and a great make ahead too. 2 large sweet potatoes, baked until very tender, peeled and mashed (about 3-4 cups), they take about 60 min. at 350F. Mashed soft baked sweet potatoes with the butter, cream and salt. Place them in 3-4 ramekins or one larger dish. 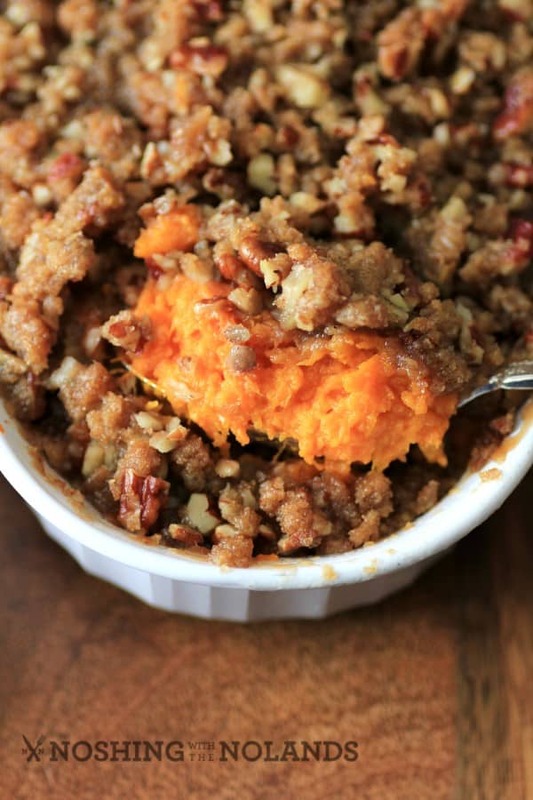 Mix the brown sugar, flour and butter together until crumbly, add the pecans and place on top of sweet potato. Bake at 350F for 20min. or until the edges are bubbling and the topping lightly browned. Serve immediately. Note: This can be made ahead. Leaving the topping off until you are about to put it in the oven. If it is made ahead you will need to bake for an additional 10-15 min. or until heated through. This was terrific! I used only half the amount of brown sugar though and it was still plenty sweet. I also boiled the sweet potatoes rather than baking them and they were fine. All variations on the theme, so glad you liked it! So happy to hear, we will be making it over the holidays too! Wow, over 100 impressive family get together!! No she didn’t. I would say theirs are sweeter than mine as they put brown sugar into the potatoes as well. Just had them at Ruth’s Chris on the weekend. I hear you Laura, and it is so good with a great steak too! I just did it using my Ninja. I boiled the sweet potatoes and peeled them before adding to the Ninja. Usually I mixed them in my mixer and have lots of strings. With the Ninja there were no strings. Also added crushed pineapple, cinnamon, nutmeg, brown sugar, maple syrup and butter. Used your topping recipe and it looks awesome! This sounds amazing. How did it taste? Can you post Karen’s add on’s please? Is it this you are taking about “I just did it using my Ninja. I boiled the sweet potatoes and peeled them before adding to the Ninja. Usually I mixed them in my mixer and have lots of strings. With the Ninja there were no strings. Also added crushed pineapple, cinnamon, nutmeg, brown sugar, maple syrup and butter. Used your topping recipe and it looks awesome!” I can’t really do that as I have not tried it myself but you can copy and paste that in or write it in the recipe. Feel free to make it your own! These potatoes are perfect!! We loved them and I don’t think they are overly sweet which is a plus in my book!! Thank you so much Laura, I don’t like them too sweet either. Can it be made without nuts due to allergy or a substitution ? Absolutely you can, just omit the nuts and enjoy! Can I put this together the day before and bake the next day? One less thing to do on Turkey day! 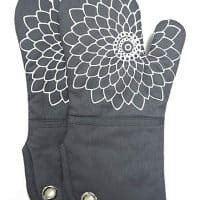 Do you know how long and at what temperature to bake the next day? Still 350 for 20 minutes? Good question Cindy, since it is cold you will need to bake it longer, maybe 30-35 min. at 350F until heated through. I will make a note of this for everyone. Can you use heavy cream? Due to the fact I will have this for other recipes Thanksgiving meal? Sure you can, it will just be richer! Nevermind! I see it! ? Can you provide an estimated WEIGHT for the sweet potatoes? I would say about a pound each. It is not a heavy cream but what we call in Canada which is 10% cream. You could go down to a 3% milk if you like for sure. I’ve never ate at Ruth Chris’, but have been making this for years! My family loves it! If we wanted to double the recipe and put this is a larger dish, what size would you recommend? I would do a 9×13″ pan, you can always up the potato some too! Do you think you could substitute corn starch rather than flour for the but topping to make gluten free? Hi Ashley, I would maybe go with another flour, like an almond flour would work better I would say but I have not tried that. I used coconut flour and it worked great! Thank you Sarah, that is helpful for people to know! What kind of flour? Self rising or all purpose? All purpose flour is what I used. It says in the recipe half and half which is 10% cream. What is a yam and what is a sweet potato, they are changed back and forth. I like to use the orange fleshed variety and we only ever see one kind here. Can you use evaporated can milk instead of 1/2 and 1/2? I would try it for sure, don’t see why not. I think that would be too sweet, one or the other would be great! My mom makes sweet casserole every year for the holidays and she puts fried apples in hers, and uses mini marshmallows instead of the half & half. 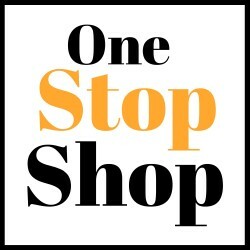 its awesome you should try it sometime. Could you cube the sweet potatoes instead of mashing them? You could but when you mash them you add in the cream, butter and salt and that adds to the dish. 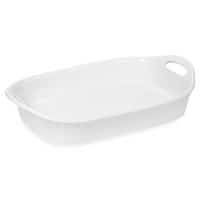 Do you need to grease your baking dish? You can grease it if you like. I’m going to make this right now for tomorrow! But, I’m using canned Sweet Potatoes. Because, I don’t want to run back to the store for the 5th time!!! lol Wish me luck ladies!!! Hi Tara! For the topping does the butter have to be cold or room temperature? Thanks in advance and Happy Thanksgiving everyone!! I use butter that is slightly softened, not ice cold. Making this for a work potluck lunch tomorrow. Preparing tonight and heating tomorrow, I’ve seen multiple different things. So would you say better to leave the topping off or if I put the topping on and leave over night okay? I’d rather put the topping on beforehand so less steps at work. Either way I think you will be fine but I would prefer to do it before putting it in the oven. 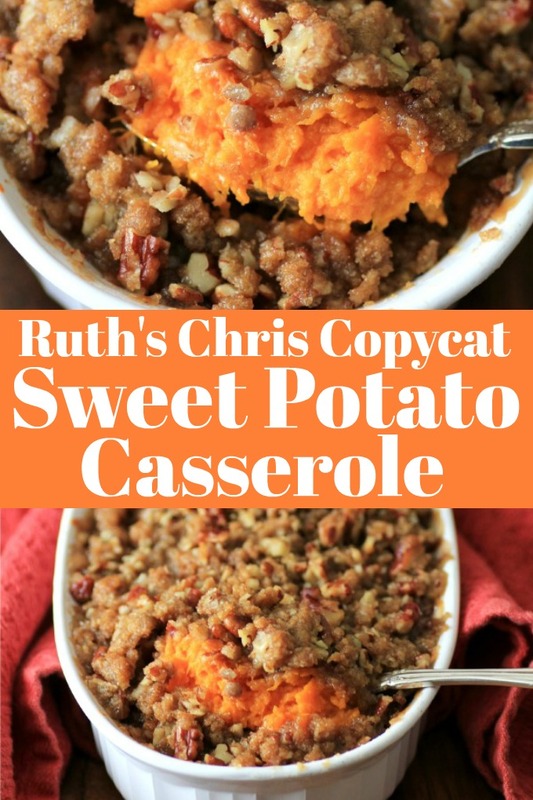 And here we are almost 2 years later and it’s still my fave RC sweet potato copy cat recipe. It will be on our 2017 Thanksgiving table in just a few hours. Awesome, so glad you like it and continue to! I would say yes, I have frozen it until after as leftovers. My father, whom in 55 years has never liked sweet potato anything LOVED this dish when I made it last year for Thanksgiving. My in-laws are obsessed with it as well. I am now obligated to bring this to any family function! Making it tonight for a dinner with friends. Thanks for posting, this dish is a hit and I’ve used your recipe a dozen times over the last year or so! I am so happy this dish has given you and so many others joy!! I have to say we really love it too! Do you have any idea how to translate this recipe to cook in a crockpot? We always have too many sides to complete with only two ovens so I’m doing as much as I can with crockpots. Any suggestions would be greatly appreciated. Thank you! I have never done this in a crockpot, I am sorry. The only thing I could think of is do it ahead of time and then reheat in the crockpot. The topping might get soggy though. I did this last year in the crockpot and bought the kind that is removable and oven safe, cooked it the night before and then through it in the oven the next day super quick just to crisp the topping and then put the dish back on the crock pot and it heated up throughout the day of. Still needs to go in the oven the day of but not for long and stays warm throughout the day! I’m excited to try this recipe out for Thanksgiving. It sounds delicious! One question, my son can’t have wheat – any chance you know what flour would be ok to use to substitute the all purpose flour? Thanks!! My girlfriend who is Celiac uses sweet rice flour or AKA glutinous rice flour. Usually found in the Asian section. Hope this helps. It definitely does. Thank you!! Thank you! I made this last year and it was gone before everything else! Couldn’t remember what kind of butter i used. Thanks! No problem, Happy Holidays to you Paige!! If you’re making aheas….Can you also make the topping ahead and keep in the fridge, just not on top? Or should you do potatoes overnight and make the topping fresh before you put it in the oven? Yes, you can make the topping ahead of time. 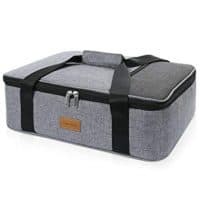 You don’t even have to refrigerate it, just leave it in a cool place sealed in a bag or bowl. Yes, that would work. You can easily double this recipe too! Wow, this was amazing! I made this for Thanksgiving and it was a huge hit. My notes on the recipe: I had to use 4 med/large yams to get 4 cups of potatoes and roasting time was ~ 1 hr, 20 mins. I am so glad you liked it. Thanks for the notes, Happy Holidays!! I don’t usually go by a particular brand but the cream I like to use is called in Canada half and half which is a 10% cream. How long do u usually bake or boil the sweet potatoes? Really depends on the size of the potatoes. Yesterday I had to bake mine for 2 hours as they were mammoths!! Just bake them until they are fork tender. Here’s the link from the new orleans’ times-picayune actual version of this dish as prepared by one of ruth’s chris chef. U may b able to see the video as he prepares it! Thank you, it is pretty similar. Don’t think you need more sugar in the sweet potatoes though. Can I prep everyhthing the night before I bake it? Yes, I just keep the topping separate and then put it on before baking. Great recipe. I made it in ramekins. I actually used three medium sized sweet potatoes. I used heavy cream and used more than called for. I just kept adding until it reached the consistency I wanted. I did add a little sugar to the potato mixture to taste. The topping was enough for me to make the recipe twice during Thanksgiving this year. It was loved by all. It is definitely a keeper; a recipe I will do again and again. I am so glad you liked it and made it TWICE!! Awesome!! Can you use a whole chicken? Not sure you meant to ask this on this post??? This is my go to recipe for Thanksgiving and Christmas. It is always the side dish that everyone likes the best! I always double the recipe and serve in a 9×13 pan. I pierce the sweet potatoes, rub them in olive oil, add plenty of salt and bake for 1 hr at 375. From there I follow the recipe exactly and always have perfectly cooked sweet potatoes— easy to hand mix and not stingy. I do a thin layer of topping and these never seem too sweet. Thanks for sharing! So glad you love these, thank you!! Happy Holidays! !